Some people with drooling problems are at increased risk of breathing saliva, food, or fluids into the lungs. This may cause harm if there is a problem with the body's normal reflexes (such as gagging and coughing). Some drooling in infants and toddlers is normal. It may occur with teething. Drooling in infants and young children may get worse with colds and allergies. Popsicles or other cold objects (such as frozen bagels) may be helpful for young children who are drooling while teething. Take care to avoid choking when a child uses any of these objects. Caregivers may try reminding the person to keep lips closed and chin up. Limit sugary foods, because they may increase the amount of saliva. Watch for skin breakdown around the lips and on the chin. The cause of the drooling has not been diagnosed. There is concern about gagging or choking. A child has a fever, difficulty breathing, or holds their head in a strange position. The provider will do a physical exam and ask questions about your symptoms and medical history. Testing depends on a person's overall health and other symptoms. Drooling caused by nervous system problems can often be managed with drugs that reduce saliva production. Different drops, patches, pills or liquid medicines may be tried. Lee AW, Hess JM. Esophagus, stomach, and duodenum. In: Walls RM, Hockberger RS, Gausche-Hill M, eds. Rosen's Emergency Medicine: Concepts and Clinical Practice. 9th ed. Philadelphia, PA: Elsevier; 2018:chap 79. 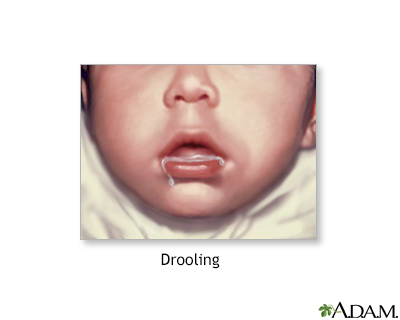 Drooling, or excessive salivation, in infants and toddlers is normal and is highly unlikely to be associated with either disease or complications.